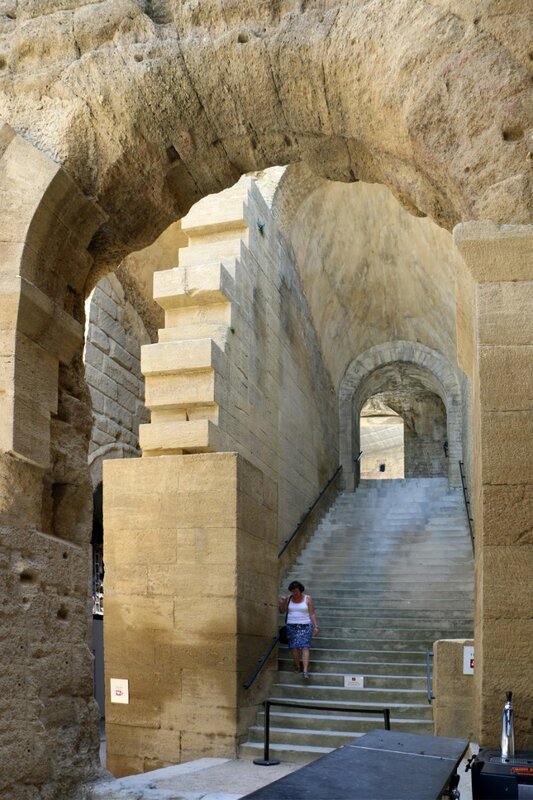 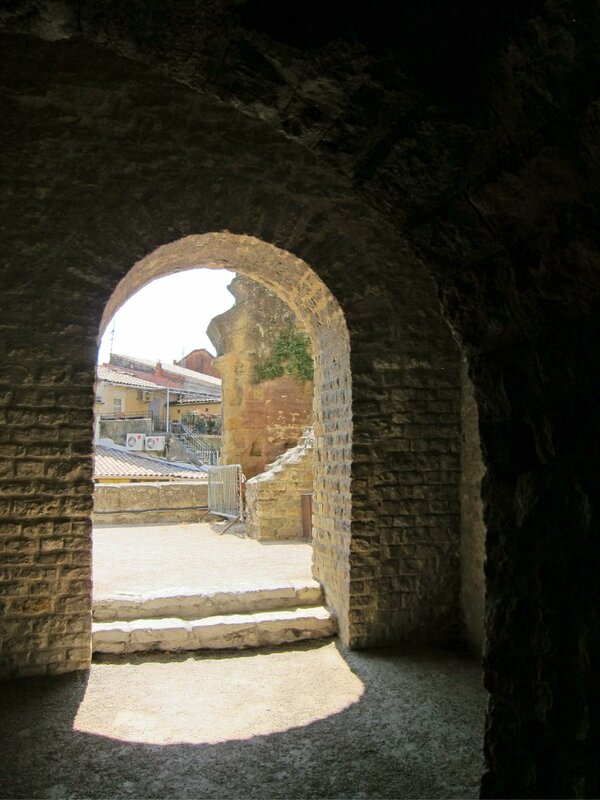 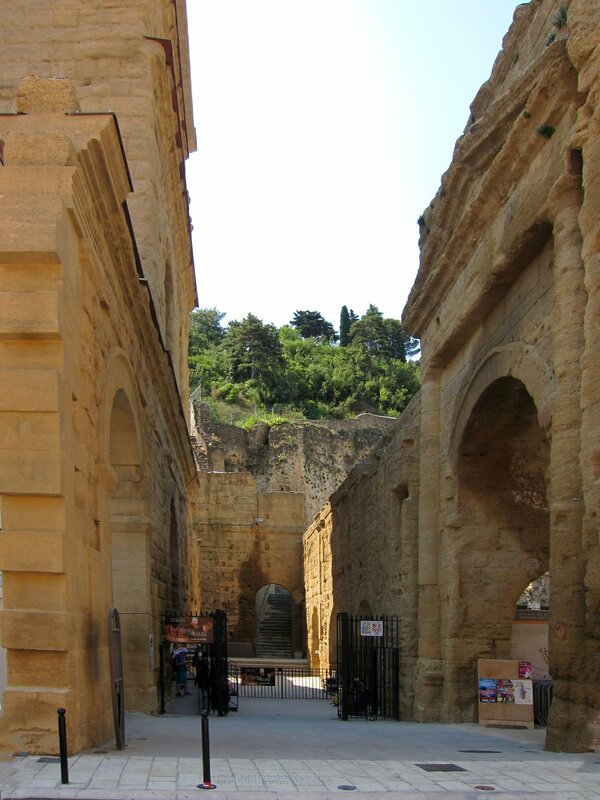 The Roman Theatre of Orange (French: Théâtre antique d’Orange) is a Roman theatre in Orange, Vaucluse, France. 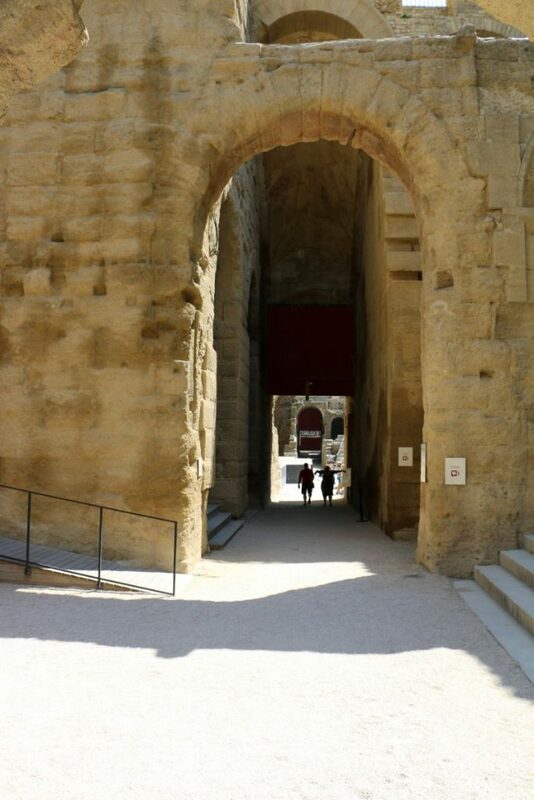 It was built early in the 1st century AD. 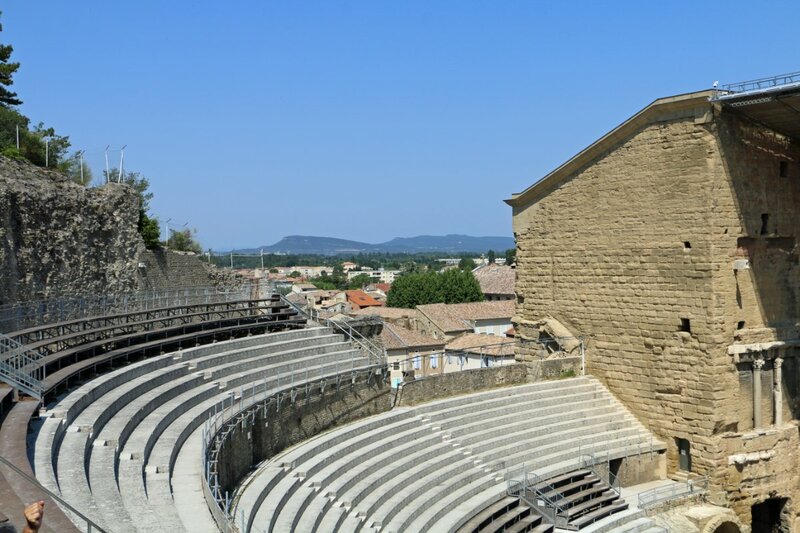 The structure is owned by the municipality of Orange and is the home of the summer opera festival, the Chorégies d’Orange. 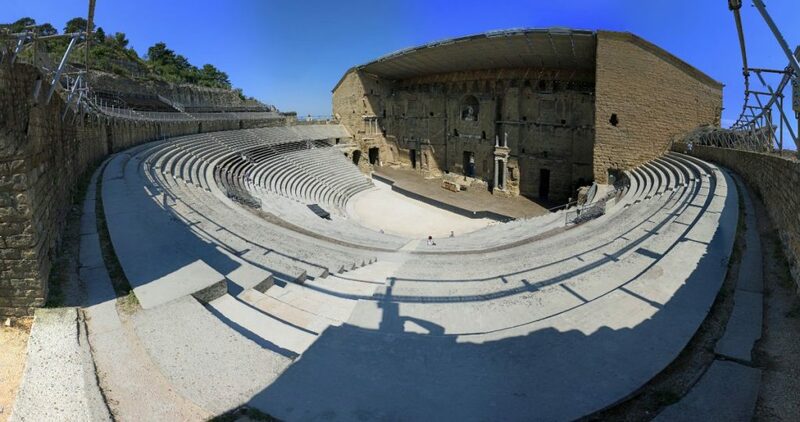 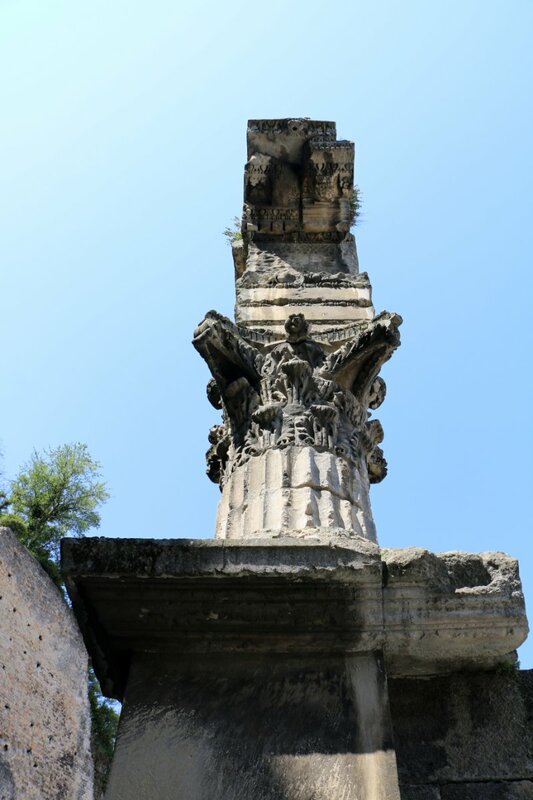 It is one of the best preserved of all Roman theatres, and served the Roman colony of Arausio (or, more specifically, Colonia Julia Firma Secundanorum Arausio: “the Julian colony of Arausio established by the soldiers of the second legion”) which was founded in 40 BC. Playing a major role in the life of the citizens, who spent a large part of their free time there, the theatre was seen by the Roman authorities not only as a means of spreading Roman culture to the colonies, but also as a way of distracting them from all political activities. 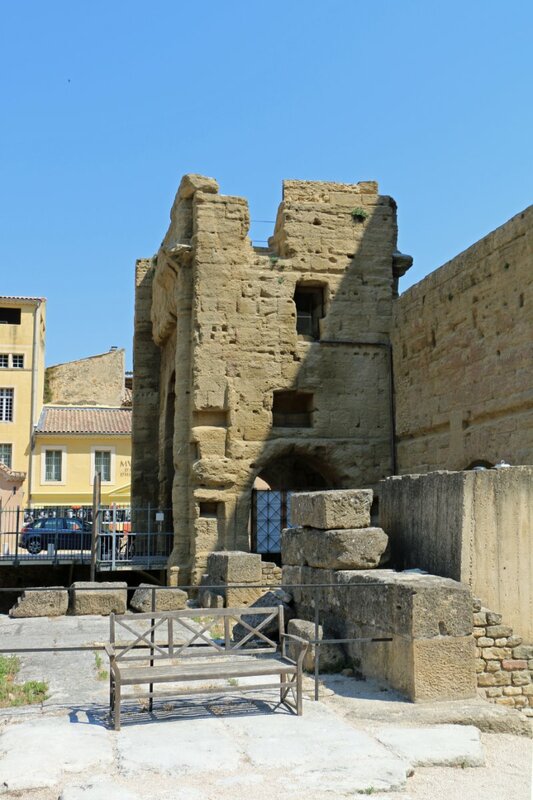 Mime, pantomime, poetry readings and the “attelana” (a kind of farce rather like the commedia dell’arte) was the dominant form of entertainment, much of which lasted all day. 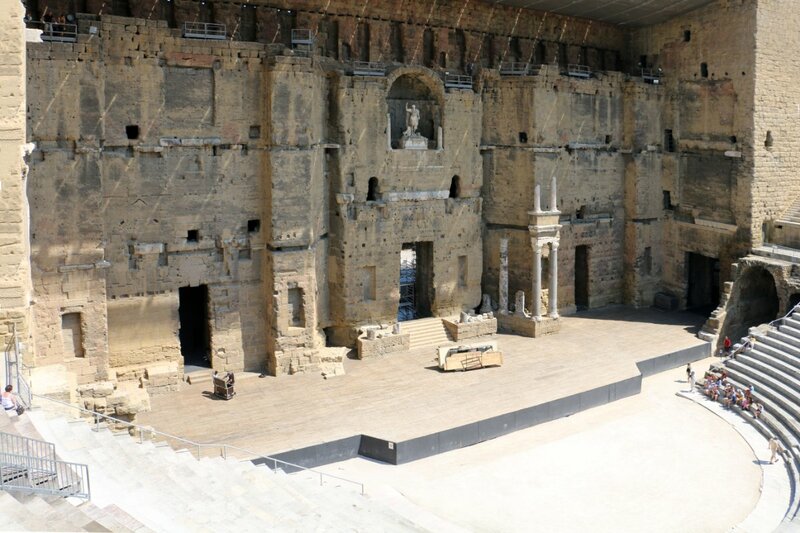 For the common people, who were fond of spectacular effects, magnificent stage sets became very important, as was the use of stage machinery. 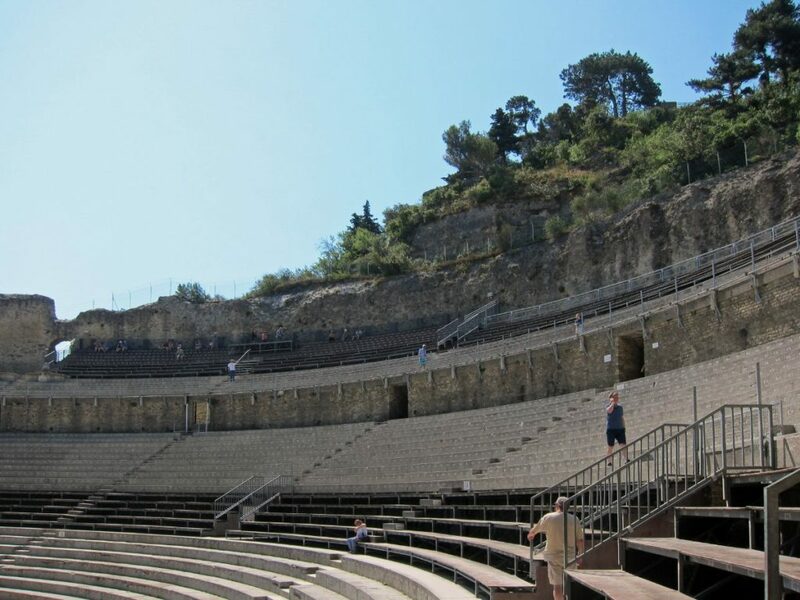 The entertainment offered was open to all and free of charge. 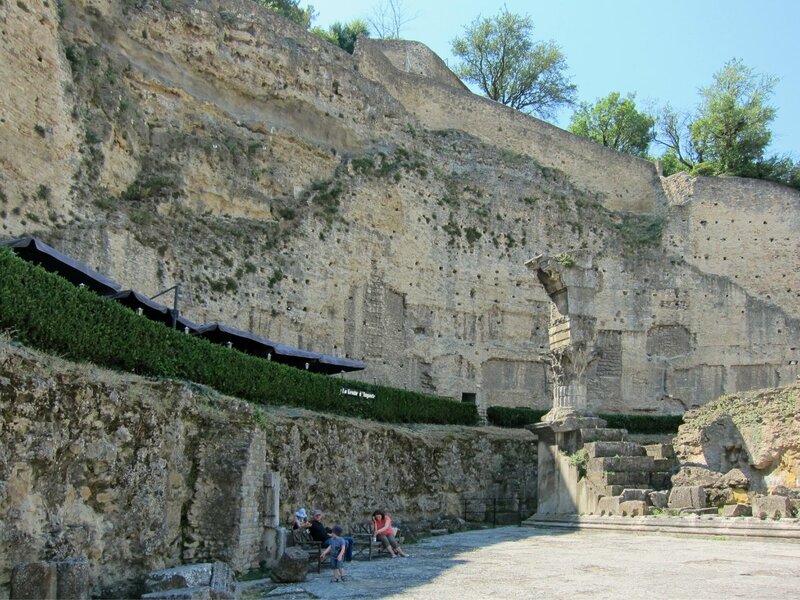 As the Western Roman Empire declined during the 4th century, by which time Christianity had become the official religion, the theatre was closed by official edict in AD 391, since the Church opposed what it regarded as uncivilized spectacles. 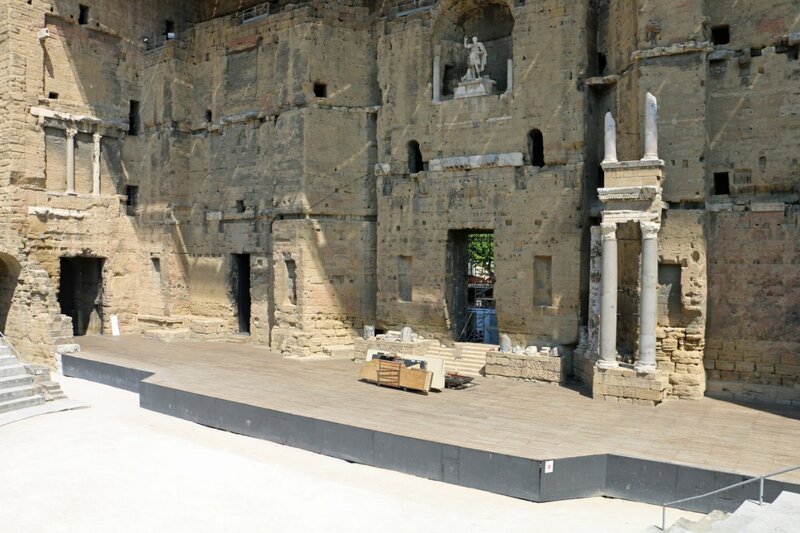 After that, the theatre was abandoned completely. 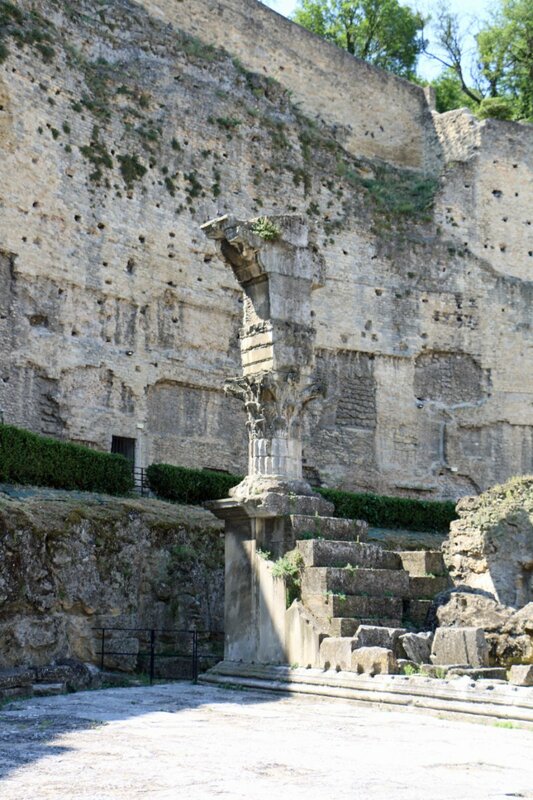 It was probably pillaged by the Visigoths in 412, and like most Roman buildings was certainly stripped of its better stone over the centuries for reuse. 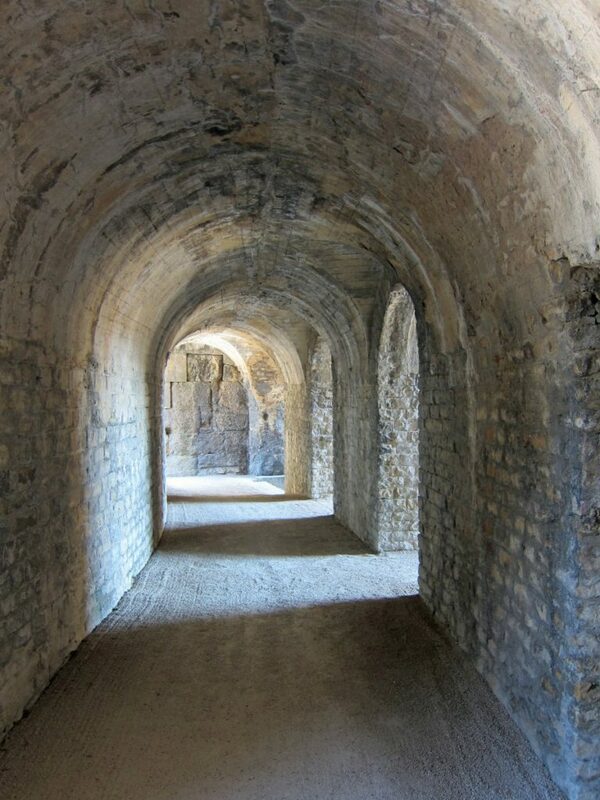 It was used as a defensive post in the Middle Ages. 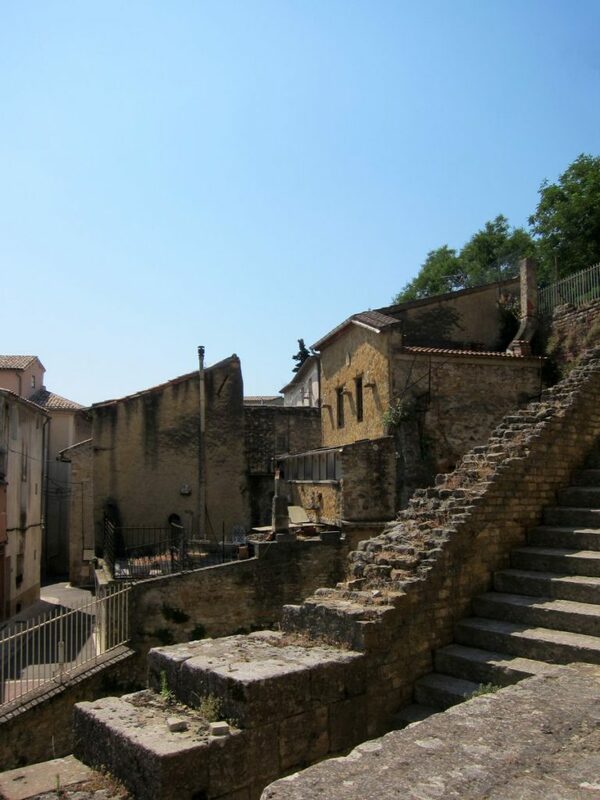 During the 16th-century religious wars, it became a refuge for the townspeople. 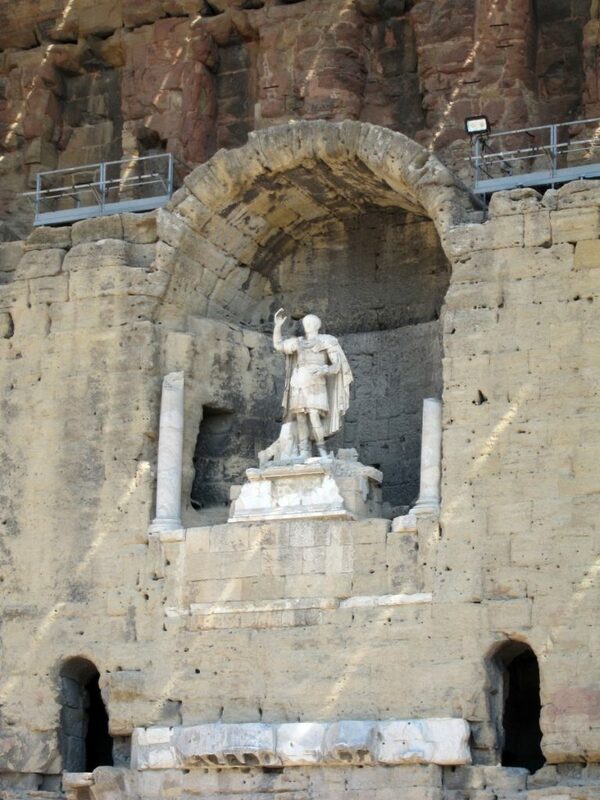 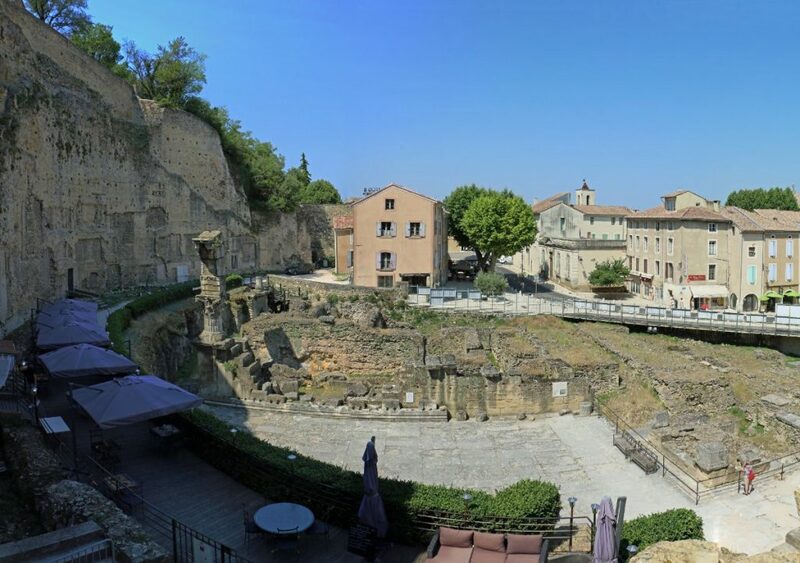 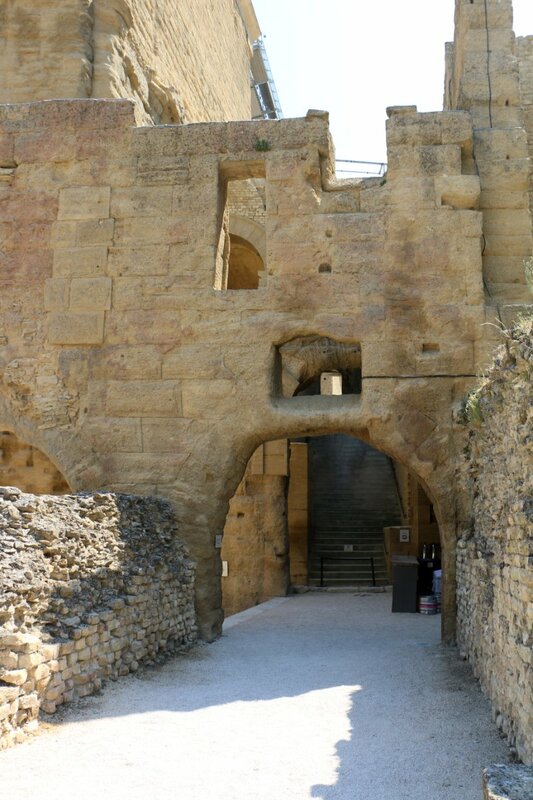 The Orange theatre was created under the rule of Augustus, and is believed to be one of the first of its kind in this area of modern-day France. 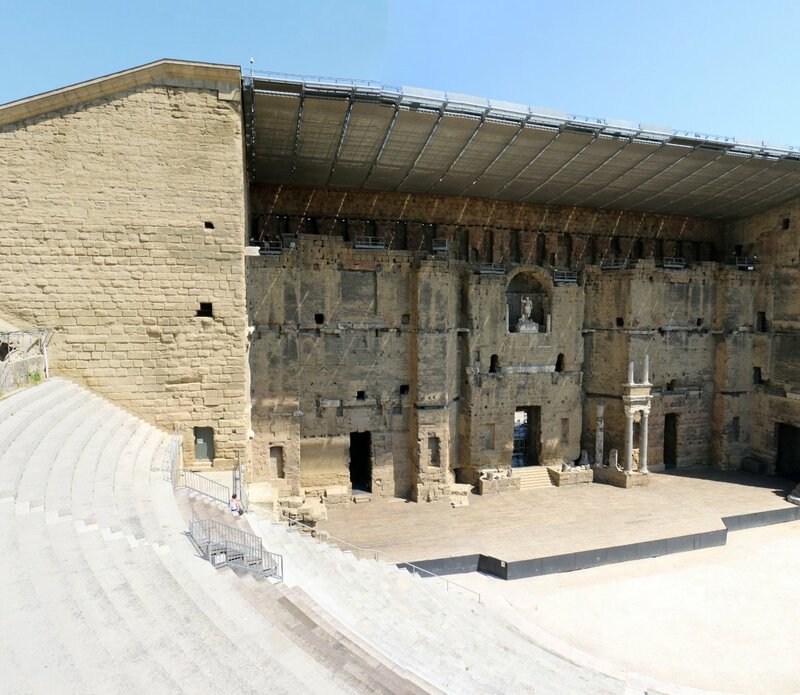 One of the most iconic parts of this structure is the grand exterior facade, which measures to be 103 meters long and 37 meters high. 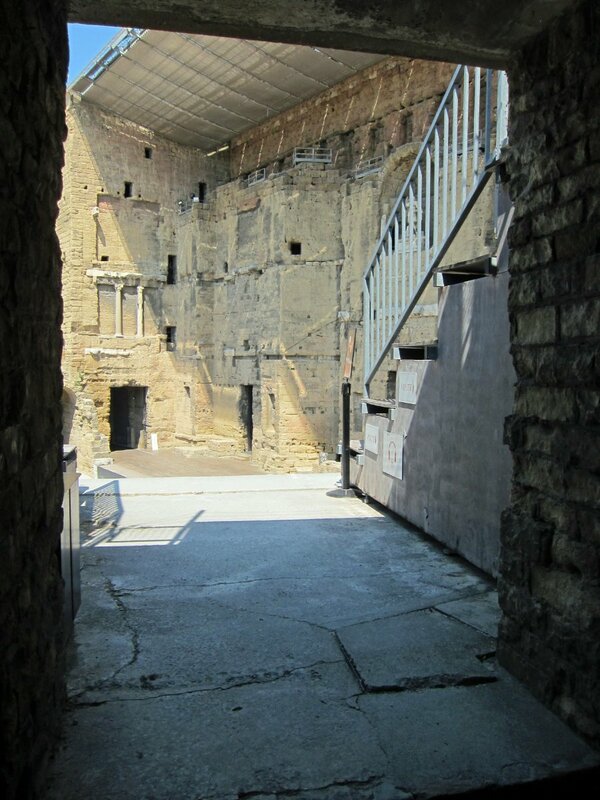 Originally, there was a wooden roof across the theatre to protect the audience from unfavorable weather conditions. 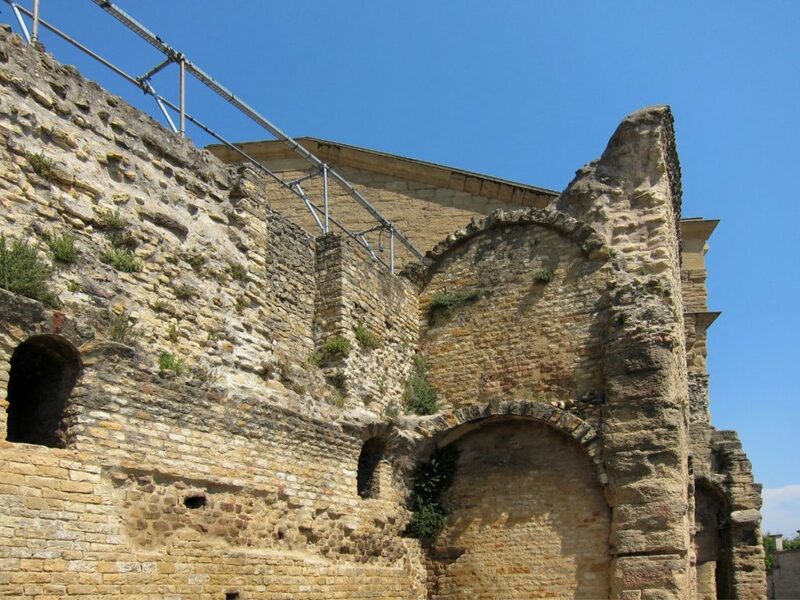 There is evidence on the walls that shows that, at some point, the roof was destroyed in a fire. 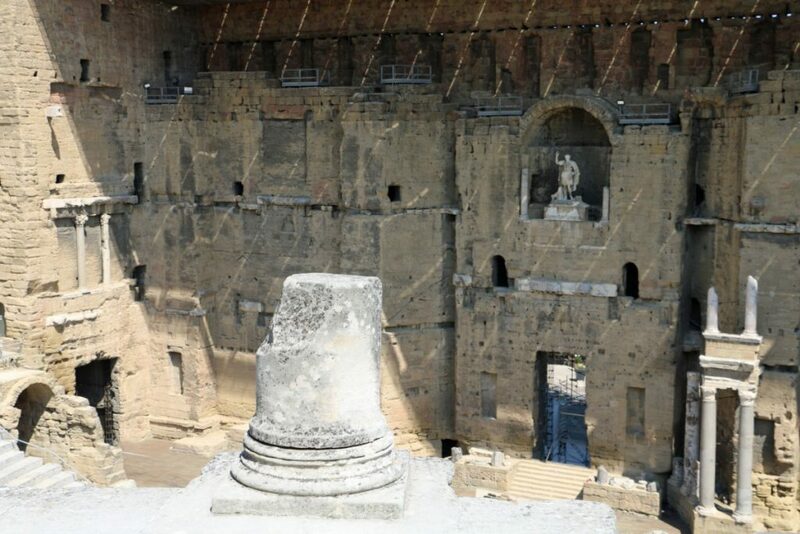 Although it is relatively sparse in decoration and embellishment, the three story wall gives an overwhelmingly powerful appearance to the entire building. 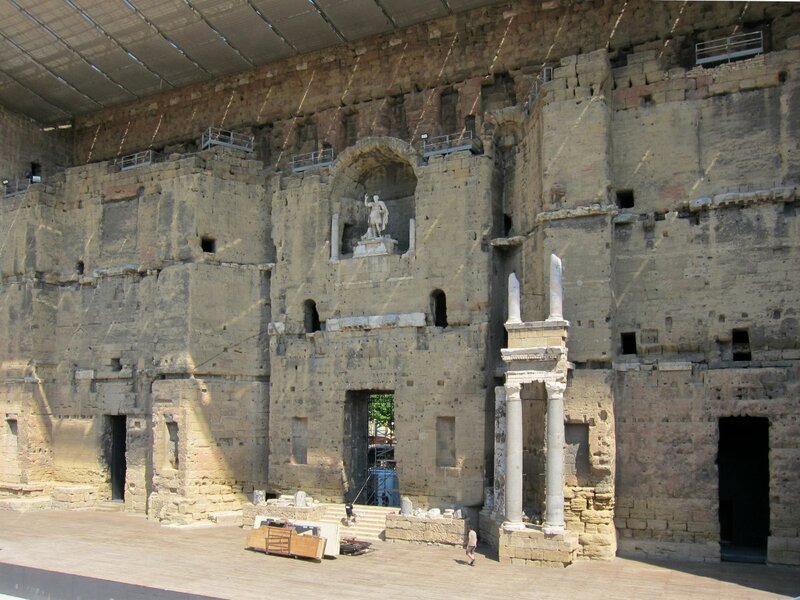 The main three doors on the first level of the facade open directly onto the stage inside the theatre, which can seat from 5,800 up to 7,300 (today, much of the seating has been reconstructed to ensure the safety of tourists and audience members). 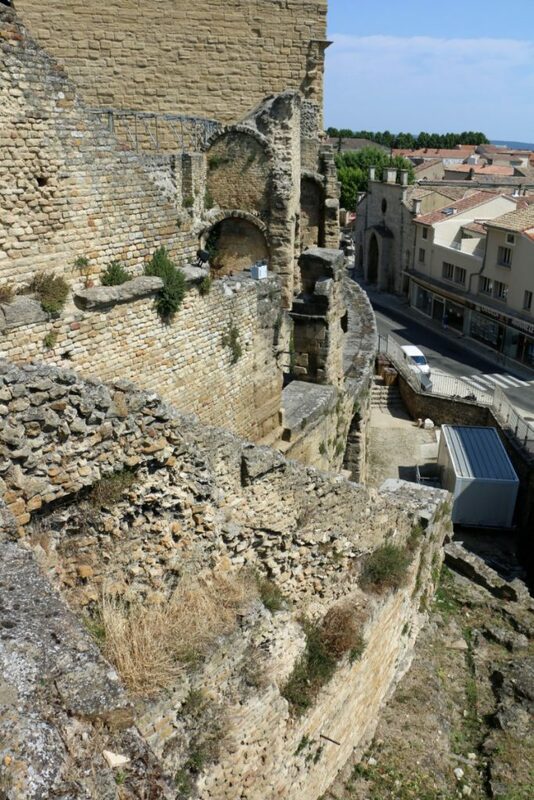 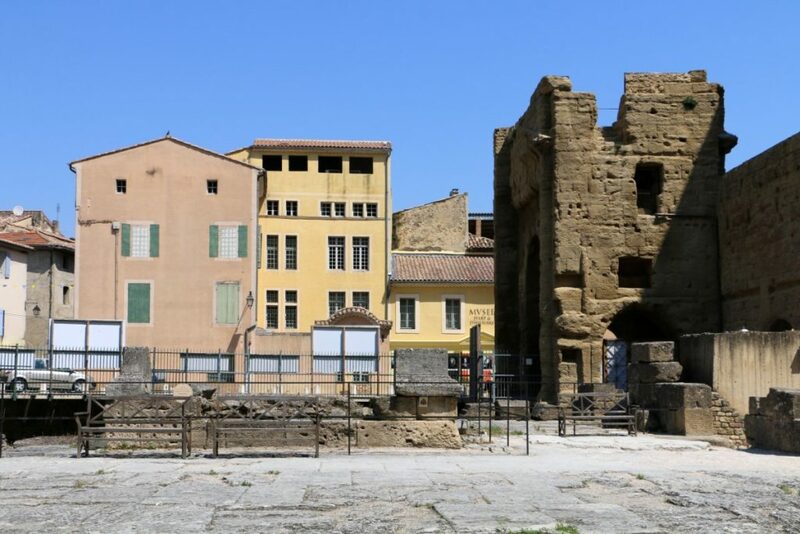 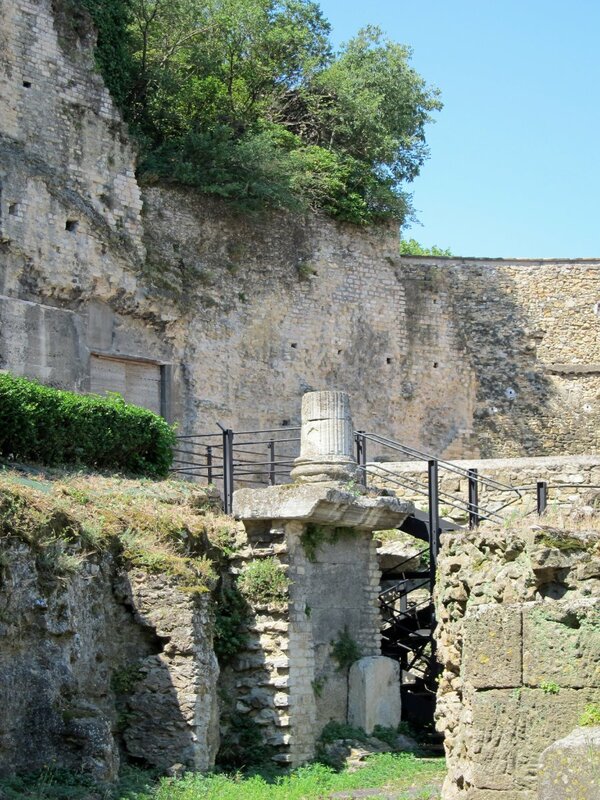 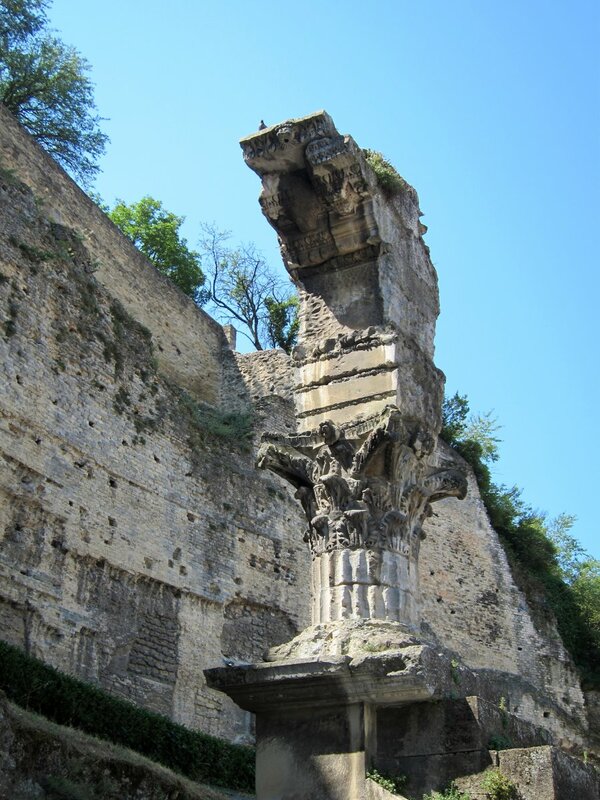 The ruins of the 2nd century CE Roman temple, probably dedicated to the emperor, which is located next to the 1st century CE theatre of Arausio (Orange, France).